This document describes the difference between a standard Box shared link and a direct link to a Box file. Box shared links are an easy, effective way to share files with a large number of people, and they are especially useful when you want to share a file with someone who doesn't have a Box account. 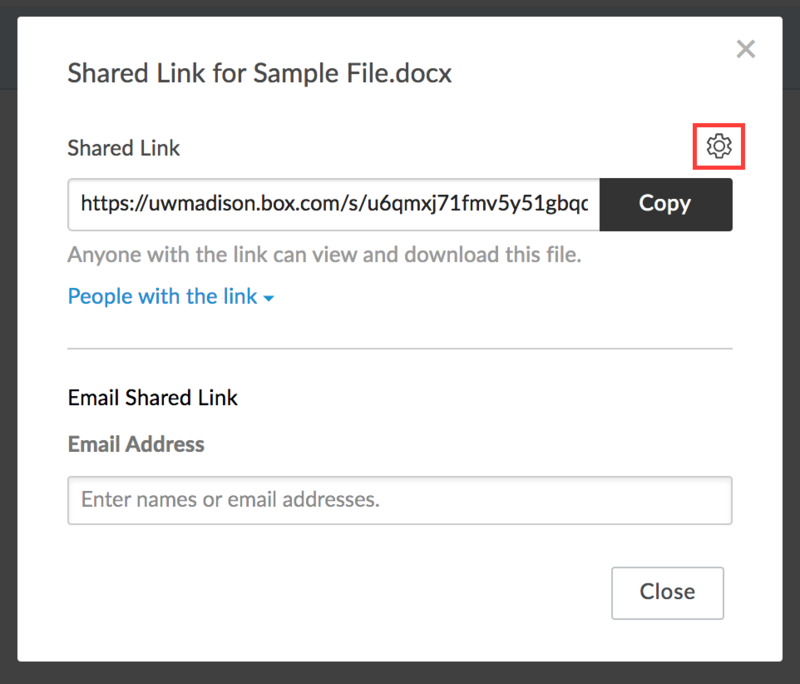 There are two types of shared links available to use, depending on how you would like the file to be accessed. For a single file, a standard Box shared link will load the file in a web browser in preview mode, provided the file type is supported for Box Content Preview. The possessor of the link will also be able to download the file to their computer, unless you have disabled this option. Shared links can also be generated for a folder, in which case, the possessor of the link will have access to the folder contents and open them individually in preview mode. List View: Hover over the item, then on the right side of the file listing, click on the Share button. Tile View: Click on the More Options button (shown as three dots) for the item. In the menu, select Share > Get Shared Link. Set the Access Type as desired, then copy the link and distribute or post it as needed. In some cases, you may wish to send a link that initiates a download of the file, rather than opening a preview. Alternately, you may want to use the link to embed the file somewhere, for example, displaying a Box-hosted image on a webpage. To accomplish this, you will want to use a direct link. In contrast to a standard shared link, direct links can only be generated for individual files, and not folders. Direct Links are only available when the Link Access Type is set to either "People with the link" or "People in your company". Direct Links cannot be created for executable files (.exe). In the "Shared Link" window, Verify the Access Type is either "People with the link" or "People in your company". Then click on the gear icon to open the Shared Link settings. 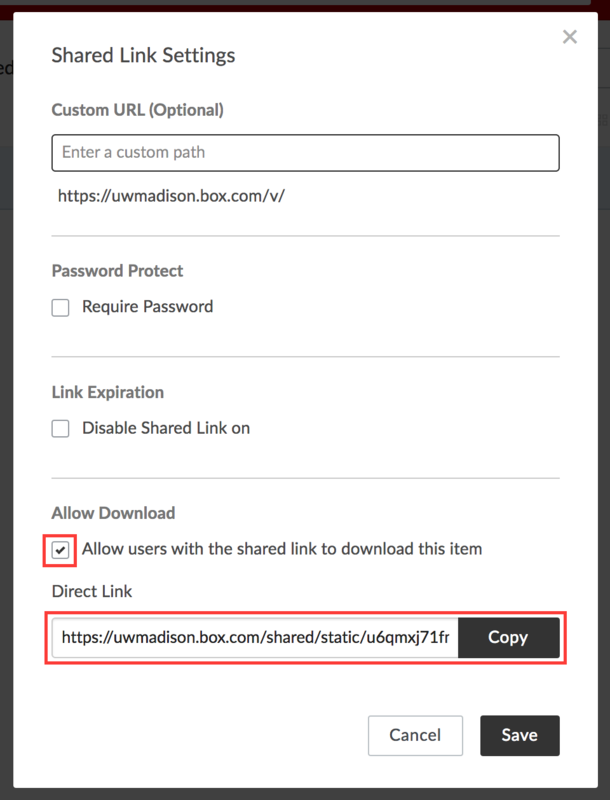 Make sure the option to "Allow users with the shared link to download this item" is checked. Then, copy the link in the "Direct Link" field and distribute or post it as needed. Note: If you enabled the "Allow Download" option while on the page, make sure you click Save before leaving the page; if you do not, your Direct Link will not work for other users.